The Very Hungry Caterpillar is a brilliant book for babies and young children, written and illustrated by Eric Carle. The book was first published in 1969 and since then has sold over 30 million copes around the world. My three children are all in their teens now but this book was a favourite in our house for many years. It makes a great gift for a new baby or for any child up to the age of two. So what makes 'The Very Hungry Caterpillar' such a wonderful book? The story's a deceptively simple one. It starts with an egg on a leaf and from the egg a tiny caterpillar emerges and starts looking around for something to eat. On Monday he eats one red apple. On Tuesday, two green pears. On Wednesday, three purple plums and so on until Sunday. On Sunday the caterpillar has a tummy ache from eating too much so he eats a single leaf and feels better. He then forms a cocoon and emerges as a beautiful butterfly. Why read The Very Hungry Caterpillar? There's so much that babies and toddlers love in this simple book. The illustrations resemble collages and are simple and colourful. The story is about the caterpillar eating, an activity that's easy for small children to relate to and understand. The text is also simple, with lots of repetition which enables littlies to predict what might be going to happen next. This makes them feel clever and builds excitement through anticipation. This is lovely on its own but being able to predict what might happen next in a story is also an important pre-reading skill. Another thing children love about The Very Hungry Caterpillar is the holes in the book that make it look as if the caterpillar has eaten his way through the pages. You can even buy a copy of the book which includes a squishy caterpillar who can be pushed through the holes as you read (see the column on the right). Although the text is very simple, there are several educational themes going on: numbers and counting, identifying different foods and the days of the week. The book also introduces children to the different life stages of a butterfly. Of course, real caterpillars don't eat the same foods as The Very Hungry Caterpillar but this didn't stop the Royal Entomological Society from endorsing it! 'The Very Hungry Caterpillar' is a great book to babies and young children because it's short and colourful with lots of repetition and rhythmic language. Small babies will just love listening to you read and looking at the pictures. Toddlers will enjoy turning the pages and, after a few readings, "reading" some of the words for you. They will also start to count with you as you read about all the things the caterpillar ate. I suggest you buy this book if you can, rather than borrowing it from the library. I can almost guarantee it will be a favourite with your child and you'll probably find yourself reading it over and over again for at least a couple of years. My three children loved it and we still have the very battered, dog-eared copy in our storeroom to prove it! 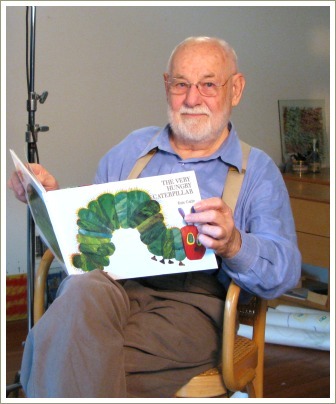 For more info about Eric Carle and his books (he's written over 70!) 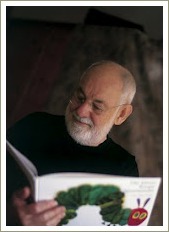 check out his website www.eric-carle.com or his blog.